White lab coats, for more than 100 years, have been associated with the medical profession. Studies have shown that patients prefer that their health care providers wear white lab coats. The primary reason is the public’s perception that the cleanliness of a white lab coat reinforces the patient’s expectation that their treatment will be based on science, by a professional, and administered in a sterile setting. Unfortunately, most of the white lab coats you see these days aren’t all that white. In the last few years colored lab coats, even black lab coats, have appeared in some clinical settings. While some medical professionals may consider this to be a new trend, black lab coats were routinely worn by medical students examining cadavers until the 1920’s, to show respect for the dead. The motivation these days is more likely an attempt to hide the grime attracted by the cheap non-functional fabrics used nowadays in most white lab coats. In an effort to address that and other deficiencies in the vast majority of white lab coats, Medelita //www.medelita.com/index.html developed a special fabric that actually repels dirt and stains. Even blood can simply be wiped away leaving no residue. Made of pristine white, subtly textured, high performance fabrics with state of the art treatments, their white lab coats are soft, comfortable, sophisticated and elegantly hand-tailored. 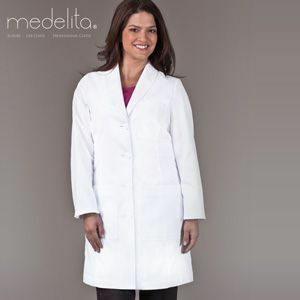 Medelita has raised the bar on the traditional white lab coat that clinicians have been wearing for more than 100 years.